The Trinity Table offers an opportunity to journey into your higher spiritual plane. This is a passive motion table, created and hand-made by Jim Harmon of Rowena, Texas. As a sacred object, the Trinity Table is offering you the opportunity to raise your consciousness and connect with your Spirit Guides. 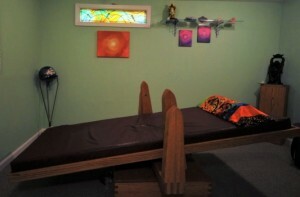 Before entering the Sacred Space of the Trinity Room each person will receive a clearing and chakra balancing. During your journey, Berena Wisewill be in the room and open her channel to see and hear what your Guides, Ascended Masters and Angels have to tell you. She will share any experiences and messages with you after your journey. You will receive a written transcript of your message. You may want to bring your own recording device. Gift yourself with the extraordinary experience of expanding your consciousness in line with this wondrous time of increased vibration and energy on Earth. LightworkersSanctuary@yahoo.com or call 214 385 1784. (includes short clearing & balance, 30-minutes on the table, channeled transcript and review time with Berena). Must be 18 years or older.